Here’s the latest edition of my Africa Update newsletter. We’ve got Mali’s 35-year old foreign minister, the dodgeball association of South Sudan, accountability for Mozambican mayors over gay rights, the future of nuclear power on the continent, and more. West Africa: Ghana’s plan to build a new national cathedral is coming in for heavy criticism. Also in Ghana, cocoa companies are working with local chiefs to improve property rights for cocoa farmers. The Nigerian government is allegedly forcing internally displaced people to return to their dangerous home regions so that they can vote in upcoming primary elections. Félicitations à Kamissa Camara, qui est devenue chef de la diplomatie malienne agée de 35 ans. In Niger, farmers are using a nitrogen-fixing tree to improve their soil quality and fight climate change. Here’s a good background article on current politics in Togo. The latest edition of West Africa Insights is all about urbanization in the region. Central Africa: Read all about the DRC’s upcoming election, including its unusual single-round voting that can allow a president to be elected with a tiny minority of votes, and Kabila’s preferred candidate for the presidency. Désarmement dans le Pool : le pasteur Ntumi fait « un pas dans la bonne direction », selon Brazzaville. This article situates Uganda’s social media tax in a long history of unfair colonial taxation. Museveni has threatened to abolish the Ugandan Parliament after protests over the beating of prominent opposition MP Bobi Wine, whose popularity clearly alarms him. Listen to this piece about poor conditions on Uganda’s prison farms. Tanzania is cutting off markets in refugee camps in an apparent attempt to force Burundian refugees to return home. Rwanda is trying to boost tax revenue by simplifying its tax code at the same time it raises tax rates. East Africa: Tanzania wants to make it illegal to question government statistics. If you’d like to approach the government with a non-statistical matter, definitely read these insider tips on how policymaking works in Tanzania. South Sudan’s newest athletic league is a dodgeball association for teenage girls. Read this insightful article about how John Garang’s death led to the fracturing of the SPLM. Don’t miss this recent report from the Kenya Human Rights Commission about the country’s high rates of extrajudicial killings. This article suggests that the Kenyan security forces routinely ignore tips about planned mass shootings, and that perpetrators are rarely arrested. More than 90% of Somalia’s new cabinet ministers are said to hold MA or PhD degrees, but only 8% are women. Southern Africa: At some South African universities, nearly 80% of black students report that they sometimes don’t have enough to eat. A South African court has ruled that marriages between Muslim couples in the country must be legally registered and not simply recorded with religious authorities, giving women legal protection in the event of divorce. Zimbabwe’s harsh laws criminalizing the transmission of HIV are discouraging people from coming for testing and treatment. Public Health: I’m excited to hear about sensors.AFRICA, which is using low cost monitors to track air quality in several countries across the continent. A non-profit organization is offering cash transfers to women who bring their children in for vaccinations in Nigeria. One Nigerian woman has created a mental health hotline after struggling to access treatment for depression. Economics: This was a really interesting thread about how legal uncertainty is increasing fuel prices in Kenya — an exemption on VAT for fuel expired on August 31 with no legal guidance on whether it was meant to be extended, leading to strikes by fuel importers. South Sudan is beginning to bring oilfields back online after production was drastically reduced by the civil war. An economist discusses how the cedi’s depreciation lead to the recent collapse of several banks in Ghana. This was an interesting piece on the history of Ghana’s failed attempts to create a local rubber processing industry. A new book argues that political conflict determines when protests take place in Africa, but economics determines who participates in them. Is there a future for civilian nuclear energy in Africa? China in Africa: This article shared some interesting reflections on the shortcomings of standard “China in Africa” narratives. Chinese handset maker Transsion is capturing the African market with affordable phones that feature built-in radio reception and cameras calibrated for darker skin. Arts and Literature: Check out Robtel Neajai Pailey’s interactive website for her anti-corruption children’s books about Liberia, and Lupita Nyong’o’s upcoming children’s book as well! Apply to work with the British Library on their collection of African-language materials. Lots of interesting articles to be found in the Johannesburg Review of Books. Read this dispatch from the Mogadishu Book Fair. The Goethe Institut is calling for submissions of young adult literature by African authors in English, French and Kiswahili. Here are all the African film festivals you can attend in 2018. Conferences and Scholarships: Register for the Decolonial Transformationsconference at the University of Sussex — and before you do, read this great curriculum which a group of Cambridge students put together for decolonizing the Human, Social and Political Sciences degree. Submit a paper to the Africa Social and Behavioral Change conference in English, French, Portuguese or Kiswahili. The Working Group in African Political Economy is now accepting paper applications. You can also send your scientific papers or science journalism to the African Science Desk to have them turned into short documentaries and explainers. Spread the word about this multidisciplinary post-doc for African scholars at Stellenbosch Institute for Advanced Study. South Sudan’s leaders are being blamed for deliberately orchestrating the country’s famine. Other African countries affected by famine, including Nigeria and Somalia, are developing their own new technologies to help coordinate relief efforts. In a step forward for Somali refugees, IGAD has agreed that they should be able to work in their host countries. A recession in Nigeria is hurting smugglers in Benin. Nigeria’s abortion laws are also desperately in need of reform. Flaws in the design of an amnesty program in the Niger Delta are encouraging more violence. On a more positive note, the Goethe-Institut in Lagos is running a new oral history project aimed at preserving local languages. Gabon is being hit hard by a drop in oil prices. Gambia’s ousted dictator is living the good life in a palace in Equatorial Guinea, which despite appearances is probably good for regional stability. Senegal is setting up a new industrial park to attract Chinese manufacturing. This is an accessible summary of current politics in Togo. This is a remarkable profile of the doctor who treated the earliest Ebola cases in Zaïre in the 1970s. Regardez ce nouveau livre: « Analyses croisées de conflits à l’est de la République Démocratique du Congo. » I loved this piece on a day in the life of a female taxi driver / sapeuse in Kinshasa. A Rwandan teenager has received scholarships to four Ivy League universities. Kigali is rushing to finish paving rural roads ahead of this year’s August elections. In Uganda, local production of sanitary pads is becoming a political issue. Housing cooperatives are tackling a dire shortage of affordable housing in Kampala. Nairobi is now the fourth most congested city in the world. Kenyan citizens are still being oppressed by archaic colonial laws. This was an incredible portrait of the women leading human rights activism in Nairobi, often at great personal cost. Here’s a good summary of current politics in Tanzania. Surgically trained nurses have dramatically reduced maternal mortality rates in Mozambique. In South Africa, the San people have written the world’s first local code of ethics for researchers. This is a remarkable article about how colonial laws reshaped women’s access to money and power across Africa. Read alongside this interesting piece on the history of colonial and post-independence archives in Africa. Cool findings of the day: this is a great podcast on insights from the African women’s leadership conference. Here are 10 Ghanaian authors you should be reading. All aboard the East African Soul Train. Check out the biomechanics of how African women carry so much on their heads. Song of the week: Run, don’t walk, to listen to “Republique Amazone,” the debut album from new West African supergroup Les Amazones d’Afrique. Angélique Kidjo, Kandia Kouyaté, Mamani Keita, Mariam Doumbia, Mariam Koné, Massan Coulibaly, Mouneissa Tandina, Nneka, Pamela Badjogo and Rokia Koné all in one place! Lise Rakner, who’s visiting Berkeley from the University of Bergen for the year, recently gave an interesting talk on how competitive elections haven’t done much to improve development outcomes in Malawi. As a rough measure of this, I compared Malawi’s economic growth since the mid-1980s to its neighbors – Mozambique, Tanzania and Zambia. I asked Lise what she attributed these divergent outcomes to, and her hypothesis was natural resources. This clearly accounts for Zambia’s higher GDP, but doesn’t explain why every country except Malawi saw a steady increase in GDP since 2000. So what’s going on? I don’t know Malawi at all, so any explanation would be appreciated! I’m only a few months behind the curve on this one – Steven Levitsky and Lucan Way had a very interesting article in December’s issue of Perspectives on Politics called “Beyond Patronage: Violent Struggle, Ruling Party Cohesion, and Authoritarian Durability” (earlier ungated version at SSRN). This paper argues that institutionalized party patronage — the focus of recent studies by Barbara Geddes, Jason Brownlee, and Beatriz Magaloni — is an ineffective source of elite cohesion. Patronage may preserve elite unity during normal times, but it is often insufficient to ensure elite cooperation during crises. The most durable party-based regimes are those that are organized around non-material sources of cohesion, such as ideology, ethnicity, or bonds of solidarity rooted in a shared experience of violent struggle. In particular, parties whose origins lie in war, violent anti-colonial struggle, revolution, or counter-insurgency are more likely to survive economic crisis, leadership succession, and opposition challenges without suffering debilitating defections. 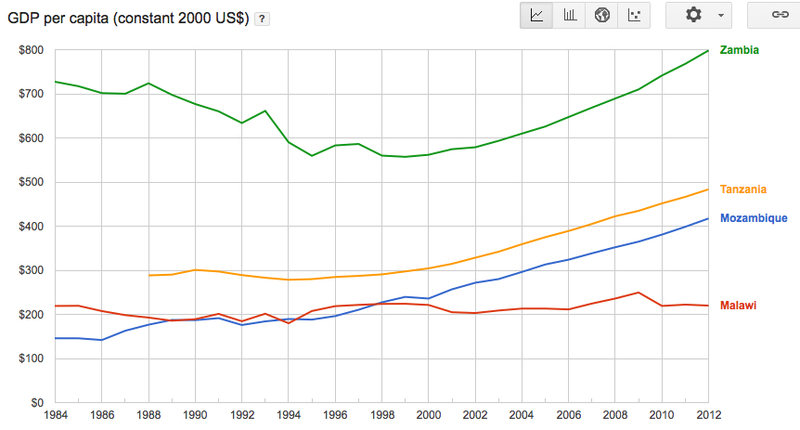 To demonstrate this argument, we compare post Cold War regime trajectories in Kenya, Mozambique, Zambia, and Zimbabwe. Pure patronage parties in Kenya (KANU) and Zambia (UNIP) that were not founded in violent struggle suffered severe defections and fell from power after the Cold War. By contrast, Frelimo in Mozambique and ZANU-PF in Zimbabwe, which were both the outgrowth of long and violent liberation struggles, remained highly cohesive and retained power in the face of powerful opposition challenges and significant economic downturn. The RPF in Rwanda fits this narrative quite well, and in a 2006 article, Filip Reyntjens noted that the CNDD in Burundi also enjoyed some legitimacy among the Hutu majority because of its role in the civil war. I wonder if this has something to do with Joseph Kabila’s unusual longevity in power, as well. He doesn’t appear terribly interested in either governing or politicking, but he does seem to lean on his father’s legacy, perhaps getting a boost from any legitimacy he might have earned during the first war. When I was in Kinshasa in 2009 I remember noting that all of the political posters featured Kabila père rather than the current president. Would be curious to hear thoughts on this from people who are more familiar with the elder Kabila’s political legacy than I am.